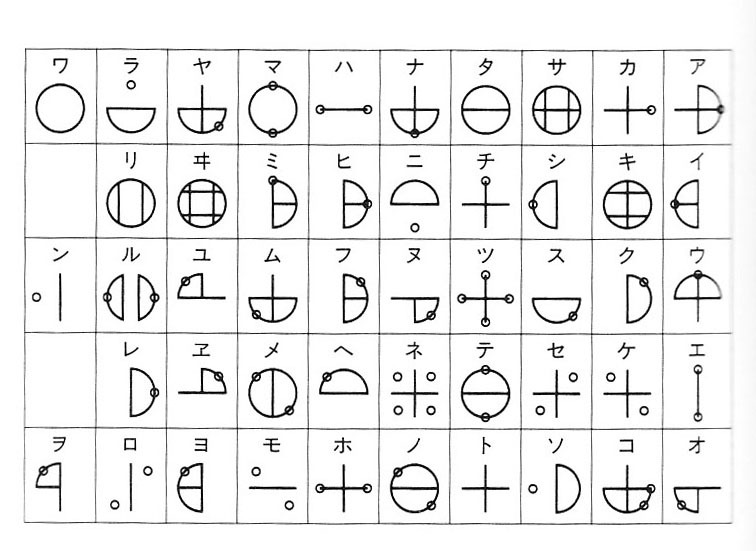 Katakamuna is an ancient civilization, a moji script, a science of the universe. This post contains information from Japanese sources in a book and on the Internet. From http://ejje.weblio.jp/sentence/content/katakamuna, whose entries come from Japanese Wikipedia. 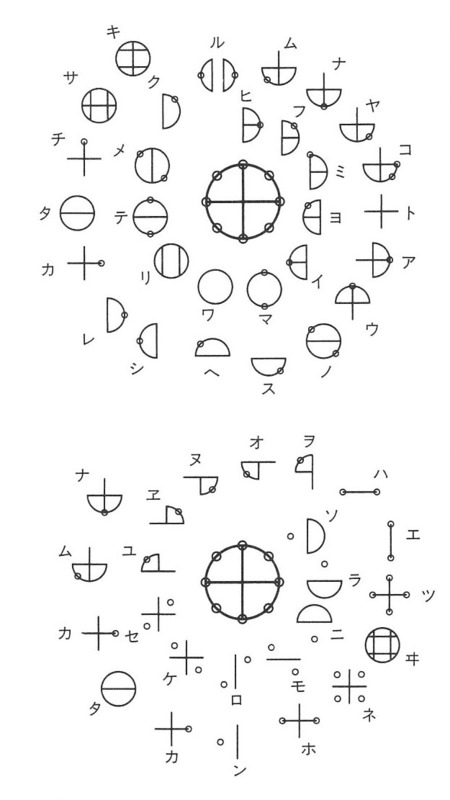 Later, Kogetsu succeeded in deciphering this document (commonly called “Katakamuna documents”) over five years. NARASAKI Kougetsu (楢崎皐月), born 1899, was a scientist who studied at Japan Electronic Engineering School. In the 1920s he was in Manchuria where he invented a special oil that blocks electricity and developed a man-made gasoline; he was in the Japanese Army that was making iron in Manchuria. After he came back, he worked in a medical company where he had a project to raise farming yields by use of electricity. So he was putting up power lines in Hyogo-ken’s Kincho-zanchu in the Rokkousan 六甲山 mountain range. He wanted to learn why a large matsu pine could grow on top of an iwa large stone. He spent five years living in the wild and this experience resulted in his writing a book. Moreover, it resulted in his discovery of Katakamuna. 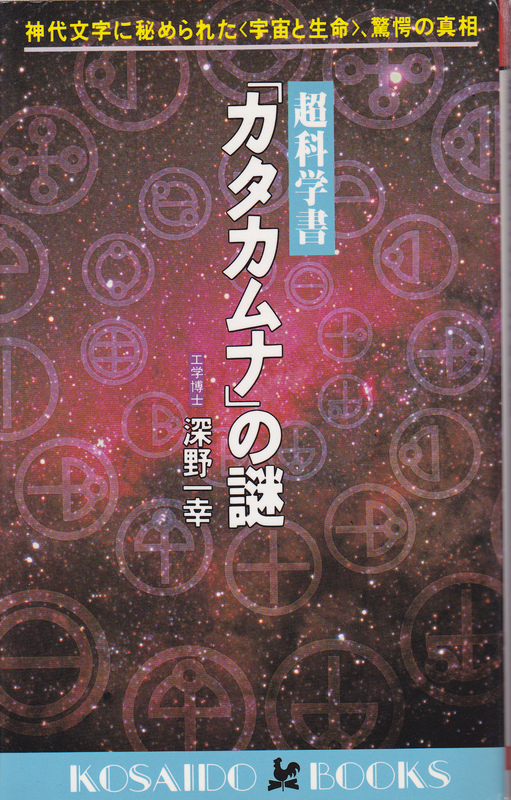 This is a book about Katakamuna, a super-science from a super-ancient civilization. The information comes from a scroll which Narasaki copied over a period of twenty days in 1949. Narasaki was studying the environment when a hunter, around 50-60 years old, appeared holding a gun. The hunter told Narasaki that the power lines were preventing animals from drinking from lakes, so Narasaki stopped doing that. In gratitude, the hunter came back and said that his father was guji at Katakamuna Jinja. He brought a makimono that he said is their goshintai, written in strange moji. He allowed Narasaki to copy the document. The document had been protected by the Hira-Ke and Meshi-Ke families. By a strange coincidence, Narasaki had studied in Manchurian temples with Taoist elders. They told him that there was once in Japan a zoku, tribe, of people called Ashiya, a civilization with a high technology. 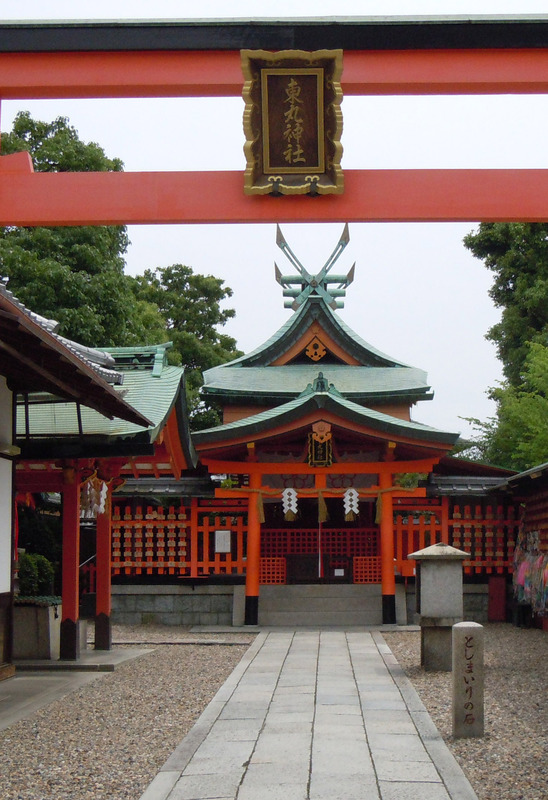 They had yatakagami writing and special iron for making steel as well as a high level of culture. Their culture came to China through the Chinese Shinoushi who brought from Japan what would be the beginning of Chinese culture. Katakamuna comes from the early Jomon at the end of the ice age more than 10,000 years ago. There are 80 uta in the Katakamuna document that Narasaki copied out in 1949. Five out of 80 were published in Narasaki’s jisho. There are other uta in this Fukano book; they were written by Narasaki, who spent five years studying the document. This is how Fusano explains Katakamuna. Thus, Kata-kamu-na is the lord of the seen and unseen worlds. A Katakamuna-jin has knowledge of the unseen world behind the world of form. Everything comes from Ama. Uchu is everything, the universe. Mari is an atom of matter. Ama creates everything, and it comes from the unseen world, Kamu-no-sekai. 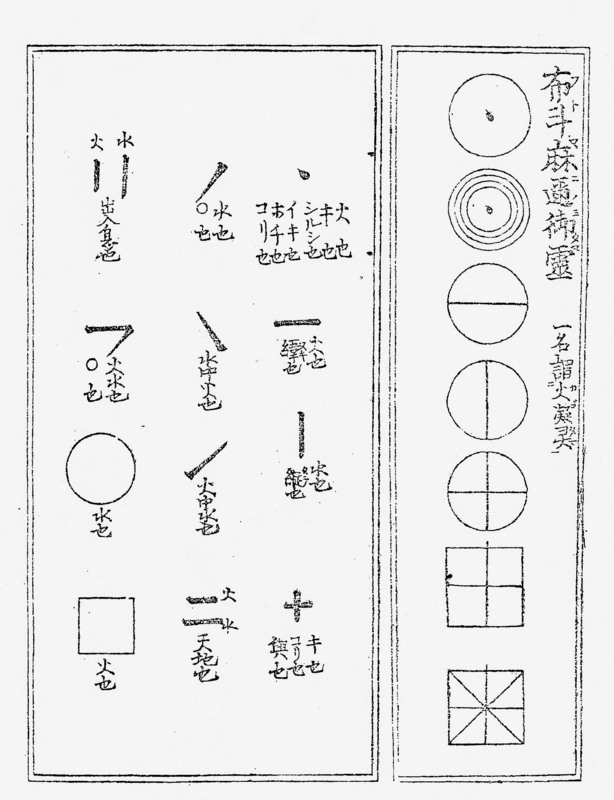 Tennen, everything, is made of 8 different rasen-no-kaiten spirals or junkai circular movements and opposite movements. Katakamuna includes the super-micro and super-macro of joukyo appearance. Seimei no honjitsu, life and mind and uchu universe. Seibetsu living organisms occur naturally, and all things have life. 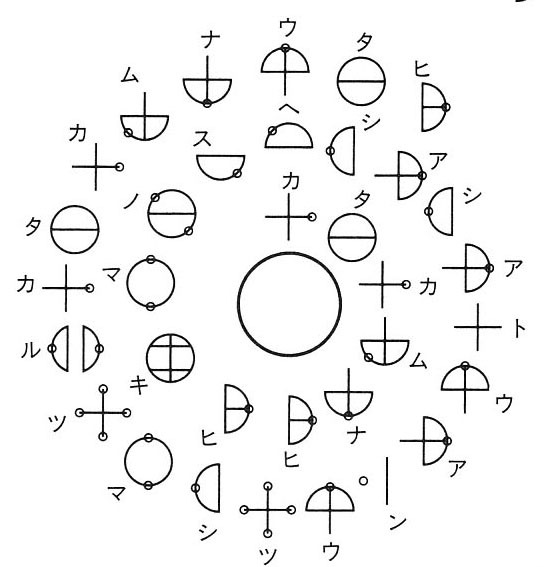 In Narasaki’s book, there are 80 uta arranged in spirals with three types of symbols in the center: Yatakagami symbol in 71 spirals, Futomani in 7, Mikumari in 2 spirals. The illustration shows the Yatakagami symbol in the center of one of the uta. katakamuna – hibiki – mano suheshi – ashia touan – utsushi – matsuri. Katakamuna – sound – mano suheshi? – Ashia Touan – wrote this – made offering in matsuri. Start reading from the center and spiral out. It seems to say that Ashia Touan received the message of Katakamuna from somewhere and he wrote it down and made an offering in matsuri. Katakamuna reveals konpongen principles of: Universe, tennen, and shizen This is something like the Universe, Heaven-and-Earth, and Nature. The first uta is telling about basic principles of everything in the seen world. The Unseen world has limitless energy, Kamu and the lord of Kamu. The Seen world is made from the Unseen world, Amana is the lord of Amana. Everything we have here is Kamuna and Amana vibration; tougou integration of Amana and Kamuna. Here are verses 5 and 6. Below them are shown the three types of centers: Yatakakami, Futomani, and Mikumari. This entry was posted in Ancient civilization and tagged Katakamuna, moji, universe on 2013/07/29 by Okunomichi. Let’s discuss rocks and stones. We often use these words interchangeably. Are they different? Instead of the common word for stone, ishi, the Japanese sometimes use the word, iwa. If the ishi is a smallish stone, then iwa is a largish rock like a boulder. When we examine the kanji 岩 for iwa, we see the character for mountain over that for stone so it represents a mountain stone. While megaliths occur naturally, there is evidence that some have been worked on by ancient people. Megaliths were often transported over great distances to special sites on the peaks of mountains (such as megaliths from the island of Shikoku on top of 2599 meter tall Mt Kinpusan in Yamanashi). Megaliths are also iwakura, stone seats for kami deities. The connotation is that kami descend from an unseen world to sit on or in the stones. Megaliths are found within iwasaka, 岩 境 or 磐 境, sacred enclosures, which were probably early shrines. Megaliths can be regarded as iwa no hashira, pillars of rock. The pillar is an important metaphor in sacred literature around the world. It represents a sacred mountain, the center of the world, the world axis. Why are megaliths sacred? Megaliths connect ki of heaven spiraling down and ki of earth spiraling up. The movements of heaven and earth are celebrated and joined in matsuri, festivals to kami of heaven and earth. I visited Kanayama Megaliths in Gifu Prefecture at the time of the autumn equinox in September. There are three Shinto shrines in front of the Iwaya-Iwakage megalith grouping, indicating that people have considered this site a sacred place. Let us note that the word, iwaya, 岩 屋, or house of rock, is also translated as cavern or grotto, and even as sanctuary, and Iwakage means the shade of the rock. It feels good to be in Iwaya-Iwakage. The beam of sunlight entering from the “ceiling” was easily revealed by the smoke of burning incense. I sat on the rock on the west side of the “sanctuary” and when I was alone, I felt Iwaya’s beauty and peace. The smoke in the sunbeam was swirling around and it was mesmerizing to watch. It seemed like there was a spiraling energy right here in Iwaya. This entry was posted in megaliths on 2013/07/23 by Okunomichi.